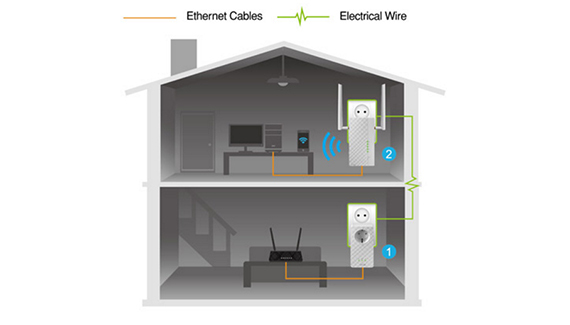 The best powerline adapters should manage to offer a reliable alternative to the traditional Ethernet wiring, allowing the user to extend the network using the home electrical lines without worrying about the weaknesses of the WiFi signal (distance, number of walls and other type of interference). Since the networking market is overcrowded in almost every department, in order to find out which are the best powerline adapters, I tested some of the most popular HomePlug and G.hn units and have compiled this comprehensive list. Before that, it’s very important to understand that a powerline adapter is not needed in every home since it isn’t that hard to have a good WiFi connection nowadays thanks to the powerful routers available (and some of them come at reasonably affordable prices), but sometimes, it’s not enough having a single router, especially if you have a large home, with thick walls and lots of interferences. In this scenario it’s inevitable that you will have wireless dead-zones, so there are a few options that you can explore. Note: We have discussed in detail what are the powerline adapters and how do they work, but to summarize, you simply use the electricity cables inside your home to carry the internet signal and have a close-to-ethernet-cables performance. 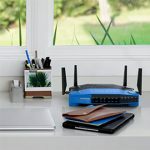 We have also discussed the possibility of using old or unused routers as access points, wireless repeaters or in bridge mode, but be aware that some options require Ethernet cables throughout your house, while others will halve the signal, leaving you with a basic, non-satisfactory Internet connection. 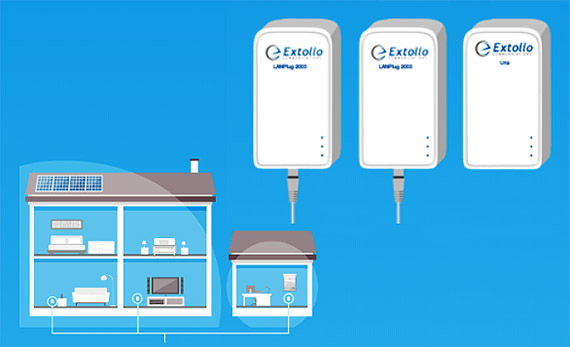 About three years ago, Extollo proudly released its LANSocket 1500, a HomePlug AV2 powerline adapter which would compete within an increasingly crowded market with the other manufacturer, but, last year, Extollo seems to have had a change of heart and left the HomePlug standard behind in favour of the less popular G.hn technology and created the Extollo LAN Plug 2000, which became the fastest powerline adapter available on the market right now. The LANPlug 2000 kit includes two identical Power line adapters, two Ethernet cables and a Quick Start Guide. Furthermore, similarly to other powerline adapters, you can simultaneously connect up to 16 LANPlug 2000 adapters on a single Gh.n domain. Note: Since it’s based on a different technology, it’s not compatible with the LANSocket 1500. The last Gh.n adapter that I saw was the Comtrend PG-9172 and, in terms of design, it didn’t differ that much from its HomePlug siblings which means that this is the preferred form-factor for this type of devices. 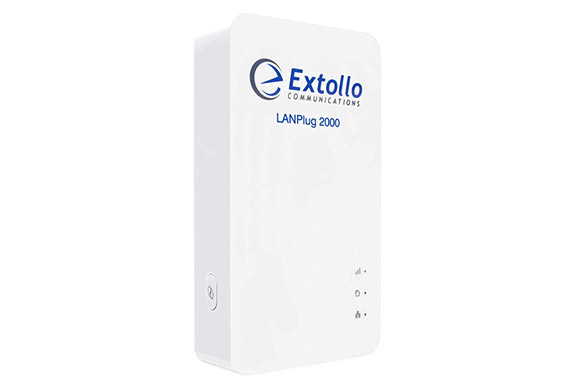 Following the same design guidelines, the Extollo LAN Plug 2000 features a rectangular case with rounded corners and it’s entirely covered by a white matte finish (it does not retain fingerprints). On the rear side, the powerline adapter has two areas of interest, one with the three-prong plug and the other with the label containing the necessary info (including the mode, the serial number and the MAC address). Unlike the LANSocket 1500, the Extollo LANPlug 2000 doesn’t have a pass-through outlet, so it shouldn’t have the luxury of being too big since it would cover additional outlets but, considering its size (it measures 4.73 x 2.56 x 1.15 inches), unfortunately, the device could definitely obstruct the top socket – you have to sacrifice at least a couple of wall outlets in your home if you want to use this kit. The front of the powerline adapter is home to three small LED lights (next to their respective icons) that show the status of Powerline Performance, the Powerline and the Ethernet. The Powerline Performance LED shows you the signal strength, so you could easily select the best place to connect the adapter, in order to get the fastest link rates. If the LED is green, you get the best speed performance (more than 200 Mbps), otherwise, if it’s amber, the link rates are between 100 and 200 Mbps and if it’s red, the speed performance is less than 100 Mbps. The Powerline LED will be solid amber when the adapter has not been paired yet, while solid green indicates that the device has been paired with another powerline adapter. On the bottom of the Extollo LAN Plug 2000, you can find a single Gigabit Ethernet RJ45 port and, on the lateral side, there’s a Pairing button (press it for 3 to 5 seconds to start the pairing process or press and hold it for about 20 seconds until both the Powerline and the Ethernet LEDs turn on in order to return the adapter to factory default settings). If you have more than one Ethernet-ready device close to each other, you will have to use a multi-port switch, because, so far, there is no variant with more than one port on the adapter. The hardware installation is, as usual, simple. First of all, you have to connect one adapter to a switch or router using the provided Ethernet cable and then into a wall socket. Next, connect a second unit to an Ethernet-ready device using the other provided cable and connect the adapter to a close-by wall socket. Afterwards you have to pair and secure the adapters. To do that you will have to press the Pairing button for 3 to 5 seconds on the first unit and then, you will have two minutes to press the Pairing button on the second unit. And the setup is done. 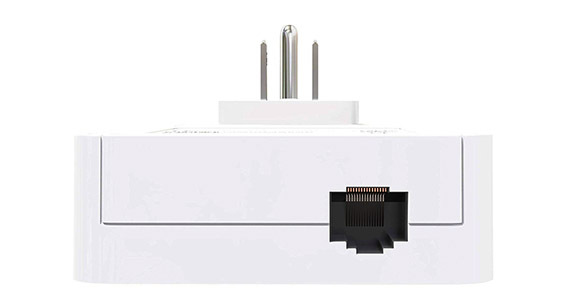 It’s true that other HomePlug powerline adapters have already implemented the MU-MIMO technology, but it’s still nice to see that Extollo decided to add it to its LANPlug 2000 (in the 2×2 form), this feature allowing simultaneous transmission of data on two of the three electrical wires (phase, neutral and ground). 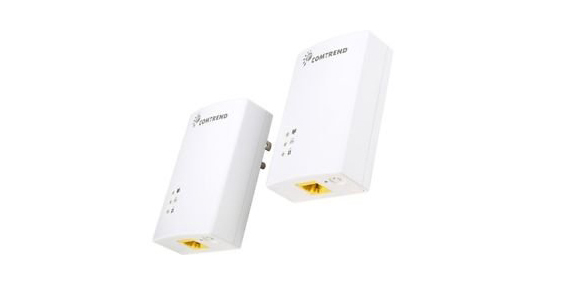 Furthermore, the powerline adapter uses the BeamForming tech to create two independent signal paths to improve the transmission of data (on a per-packet basis) to and from the client (Extollo claims gains between 2 to 5 dB). 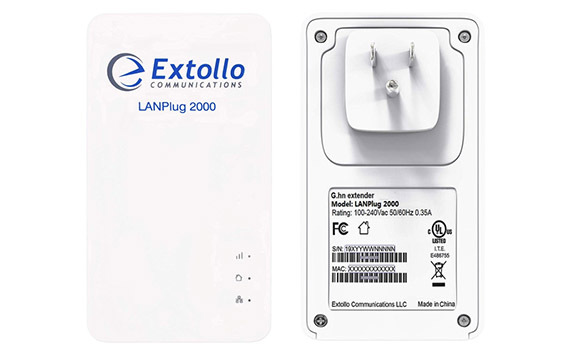 Having two units 10 feet apart, on the same circuit, with less to no interferences, the Extollo LANPlug 2000 went up to 285 Mbps (on a 300 Mbps plan). At around 30-35 feet (on the same circuit, but with some interferences), the adapter surprisingly remained at around 260 Mbps, which makes it the best performing powerline adapter, better than what some HomePlug devices from the competition have to offer. Note: Extollo also provides an integrated GUI for managing the powerline adapter and, to access it, you need to identify the IP address that it received from the router, insert the address into a web browser and, when asked, write ECLP2000 as the password; once you gained access to the interface, you can change the Domain Name, select the node Type (Domain Master or End Point), change the Profile and the pairing Password, configure the IP settings, update the Firmware and more. 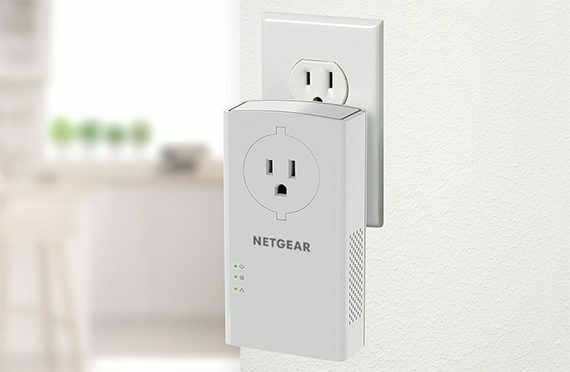 Following in the footsteps of the popular PL1200, Netgear has released a new powerline adapter at the end of the last year, called the PLP2000 which, besides featuring everything that made the PL1200 a better product than its competitors (such as the extra noise-filtered pass-through power outlet and the multiple data streams (MIMO) for an improved coverage), it now comes with a better speed performance, thus making it one of the most desirable powerline adapters on the market. The kit includes two long, 6.5-foot Ethernet cables, a Quick Start Guide and two identical powerline adapters (each with extra outlets). Similarly to almost all other powerline adapters in this list (except for the TP-Link adapters), the Netgear PLP2000 allows the user to connect up to 16 adapters on a single network (8 active nodes). The Netgear PLP2000 sports the same ergonomic rectangular shape as the other powerline adapters, with soft rounded corners and a white matte finish covering the entire surface (does not retain fingerprints). A single unit measures 5.25 x 2.83 x 1.49 inches (and weighs 0.53 lbs), so it is slightly larger than the PL1200 and it most likely will cover an adjacent power outlet, but thankfully, it does have a built-in pass-through outlet to make up for it (so you can still connect an additional device to that wall socket, if you need to). Note: Using the pass-through outlet may eliminate some electrical noise (because it uses a narrower frequency range). Similarly to a lot of adapters, the Netgear PLP2000 uses a three-prong plug and is HomePlug AV2 MIMO compliant (including the compatibility with the IEEE 1901 and the IEEE 802.3 standards). To ensure that the device has a proper heat management and that it won’t overheat, Netgear has added two sets of vent holes on the lateral sides (one on each side) – something that we also saw with the PL1200, but often neglected by other manufacturers. Furthermore, the front of the adapter is home to three LED lights (just underneath the built-in socket) which are responsible for showing the status of the Power, the Pick A Plug and Ethernet. The Power LED will flash once every second when the adapter is in the process of setting up the security and will blink slowly (about once every 3 seconds), when the device is in power saving mode. The Pick a Plug LED will show you the best spot to connect the adapter by displaying a solid green colour, when the signal is strong and the connection is in good conditions (the link rate will be above 80 Mbps), it will display amber if the connection is fair (a link rate between 50 and 80 Mbps) and the LED will be red if the signal is poor, where it’s recommended to choose another outlet (the link rate will be below 50 Mbps). If the Powerline LED is turned off, it means that the unit could not find compatible powerline adapters that use the same encryption key. On the bottom of the adapter you will find two Gigabit Ethernet ports and on the right side of the unit, there is the Security / Factory Reset button (press and hold the button for 1 to 3 seconds to automatically create a secure powerline network and press and hold the button for 8 to 10 seconds to return the device to factory default settings). Since Netgear decided to add only two ports, if you had more than one Ethernet-ready devices, you have to either use one adapter per device or purchase a multi-port Ethernet switch. 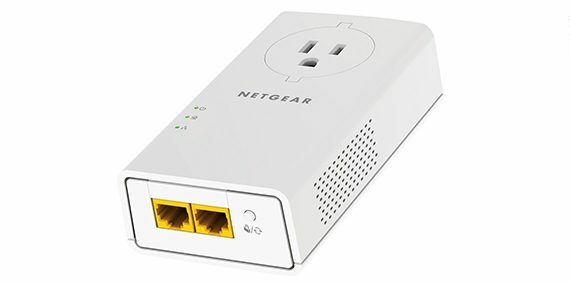 In order to setup the Netgear PLP2000, you have to connect one powerline unit to a router or gateway using the provided Ethernet cable (use a LAN port) and plug the unit into a wall socket (wait until the Pick A Plug LEDs is lit). Afterwards, repeat the same steps for the second unit and make sure to keep it close to your appliances (so you can easily connect to the desired device – TV, Desktop computer, console or even another access point). Next, in order to secure the network (using a 128-bit AES encryption), press and hold the Security / Factory Reset button for two seconds and then, you have 2 minutes to press the Security / Factory Reset button on the second unit. Now, wait until the powerline network recognizes each powerline device (it can take up to 80 seconds or as little as 5 seconds) and, when the Power LEDs stops blinking, the installation process is complete. 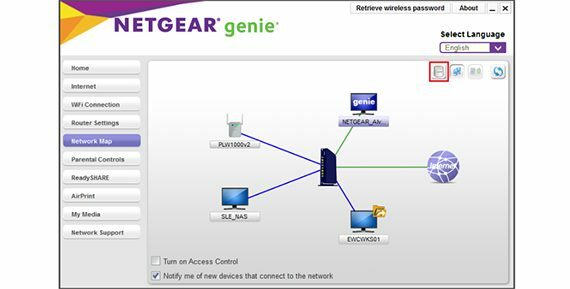 If you install the Netgear genie app on your computer, by navigating to the Network Map and selecting the powerline adapter, you can see the speed performance, perform a reset to factory default settings, view some device stats and more. In order to test the adapter, we tried to emulate an ideal scenario, keeping the adapters close to each other, at around 10 feet, using the same circuit and maintaining the interferences to a minimum. This delivered a maximum speed of 348 Mbps (with an average of 340 Mbps). To emulate a more realistic scenario, we added some interferences, put about 30 feet between the adapters and we measured no more than 214 Mbps. As you know, every home is unique and depending on the wiring setup, it is possible to get better or worse speed rates. 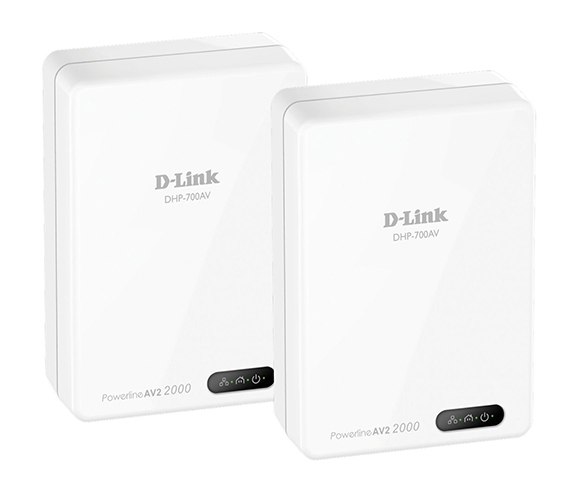 The D-Link Powerline DHCP-701AV supports the latest AV2 2000 standard and was released at the end of 2014. 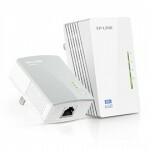 The kit includes two identical powerline adapters, a Quick Install Guide and two Ethernet cables. 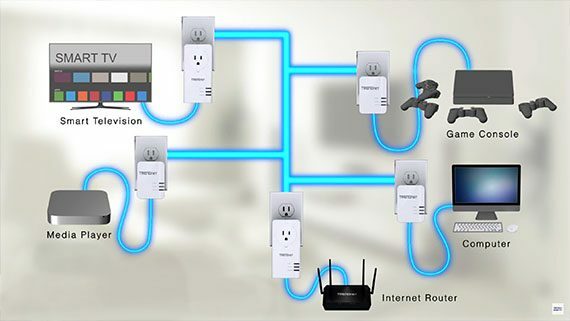 Similarly to Netgear PL1200, you can connect a maximum of 16 adapters using a single powerline network. The D-Link DHCP-701AV features a small and compact case, with a white, glossy finish and a small black bar around the LED lights. A single unit measures 3.89×2.86×1.34 inches and weighs 0.3 lbs. Overall, it’s smaller and lighter than the Netgear PL1200 and, most likely, won’t block any adjacent power outlet. Still, in case it does cover an extra outlet, unfortunately, there is no pass-through option for the DHCP-701AV adapter, the room in which is installed will have one less power socket. 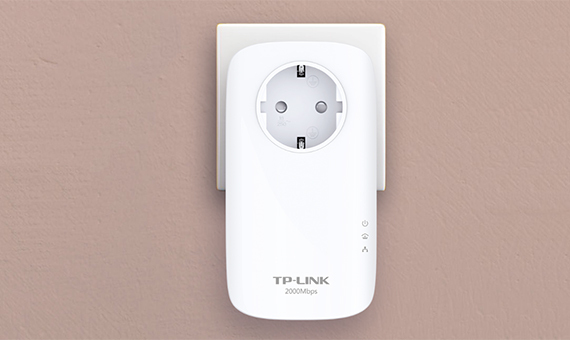 The D-Link adapter is HomePlug Av2 compliant and uses a three-pong plug. The front of the adapter is where you’ll find the LED lights for Power, Ethernet and Powerline. The Powerline LED light uses the same system as the Pick and Plug from the Netgear to help you choose the best outlet for the best connection. So, if the LED light is green, then the link rate is the best, if the LED light is amber, then the link rate is better and lastly, if the LED is red, then the link rate is good. The bottom of the D-Link DHCP-701AV is home to the recessed Reset button (hold it for 10 seconds to reset the adapter to factory settings), a Simple Connect button (for security, it uses a 128-Bit AES encryption) and one Gigabit Ethernet Port. Note: Since the adapter has only one Ethernet port and there is no version with multiple ports available, you will not be able to connect more than one Ethernet-ready devices (there are multi-port Ethernet Switches available on the market). Setting up the D-Link Powerline DHCP-701AV doesn’t require more steps than the usual powerline adapter. You just have to connect the first adapter to a router or switch using one of the provided Ethernet cables (use the LAN ports) and then plug it into a nearby wall socket. Next, connect the second adapter, also using an Ethernet cable to an Ethernet-ready device (PC, console, TV or a printer) and plug it into a electrical outlet. Now, you have to wait for the Power and Ethernet LED lights to turn green and afterwards, use the Simple Connect button to secure your network (press it for two seconds on one unit and then you have two minutes to press the same button on the other unit). Note: You can also use the Quick Install Guide if you get in trouble. The D-Link DHCP-701AV is advertised to be able to reach 2000 Mbps, which obviously won’t happen, first of all because it represents the receive and transmit rates counted together and second of all because it really depends on the wiring conditions. So, we won’t expect outrageous link rates. 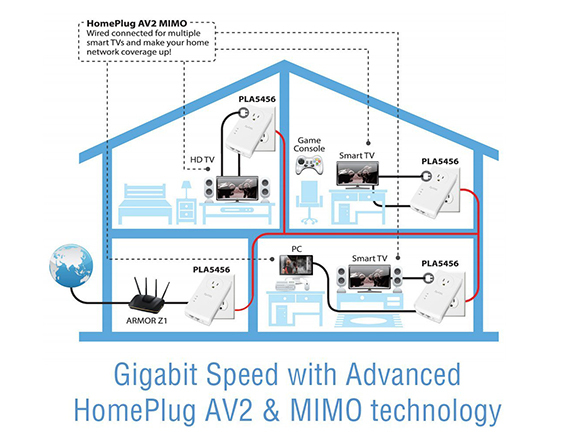 Still, the adapter did pretty good and let’s not forget that it uses the Broadcom HomePlug AV2 MIMO chip, which should give it an edge over the competition. In close to ideal conditions, keeping the adapters at about 10 feet apart and with less to no interferences, we measured up to 320 Mbps. Using not-so-ideal-conditions (a different room at around 30 feet, some interferences), it didn’t go below 180 Mbps. But keep in mind that the state of your electric wiring is a decisive factor and using a different circuit will deliver lower speeds. The ZyXEL adapters are a bit peculiar, but not in the hardware sense, more about the manufacturer. Both this model and the previous (the PLA5405) are not certified by the HomePlug Alliance, even though both carry the AV label. Obviously, this wasn’t a problem with the previous model and it won’t be with this one because there is interoperability with other HomePlug adapters (although ZyXEL makes no promises). Another thing you should know is that while the ZyXEL PLA5405 was based on QualComm chips, the newer PLA5456 is based on Broadcom chips, so they may not play well together. Keeping this in mind, know that the kit includes two identical adapters, 56-inch Ethernet cables and a Quick Install Guide. You can add up to 16 devices on the same powerline network. ZyXEL PLA5456KIT features the same white and glossy compact case we are accustomed with (it’s a very popular design since it’s very operational and convenient to use). A single unit measures 5.25×2.79×1.51 inches and weighs 0.5 lb, so it’s bulkier and heavier than the usual powerline adapter, but there is a reason for it, the PLA5405 has a built-in pass-through outlet. This means that even if the unit obstructs an additional outlet, you still get to use that power socket for any other device, making it extremely convenient. But that’s not all, on the bottom of the adapter, next to the Encrypt/Reset button (providing a 128-bit AES encryption), there are two Ethernet ports. Having more than one Ethernet-ready devices nearby to connect to the adapter won’t be a problem any more. Note: The ZyXEL adapter uses a three-pong plug (also known as a cheater plug). On the front of the ZyXEL PLA5456, underneath the pass-through outlet, there are three LED lights for Power, Ethernet and Powerline. The Powerline LED shows you which is the best outlet to plug in your adapter so you get the best performance. If the LED is green, then you get the best link rates, otherwise, if it’s amber, it means you’re getting better link rates and if it’s red, you receive good link rates. Setting up the ZyXEL PLA5456 is really easy and generic (the same steps for most adapters). First of all, you have to connect a unit to a router or a switch using an Ethernet cable (use the LAN ports) and then just plug it into the wall. The same steps should be followed for the second unit, but this time connect it to one or two Ethernet-ready devices. Be careful that the included Ethernet cables are quite short (these cables aren’t really expensive). Next, in order to secure the network you should press and hold the Reset/Encrypt button for 2 seconds and press the same button on the second unit within 2 minutes. The advertised speed of the ZyXEL PLA5456 is 1800 Mbps (full-duplex, combined received and transmit rates) and during our tests, it reached 802.11n comparable throughput (although lower than the advertised rates, obviously). Also, let’s not forget that the adapter uses a Broadcom based chip and the excellent MIMO technology. So, in close to ideal conditions (on the same circuit, 10 feet apart and with less interferences), the PLA5456 delivered speeds up to 360 Mbps. In real-life conditions (at around 30 feet, different rooms and some interferences), the speed averaged at about 195 Mbps. 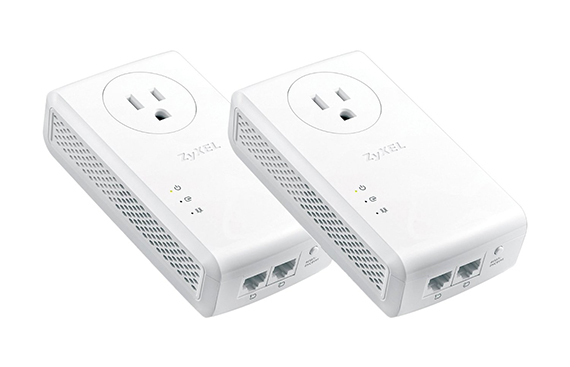 The ZyXEL PLA5456 performed really great and is a good addition to a home without CAT5/6 wiring. 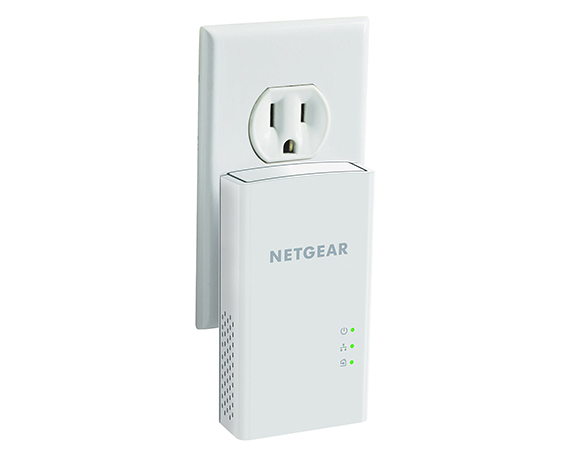 The Netgear Powerline 1200 is a very popular adapter, released at the beginning of 2015. The kit consists of two powerline adapters, a Quick Start Guide and two Ethernet cables (6.5-foot long). You can connect a maximum of 16 adapters on a single network. 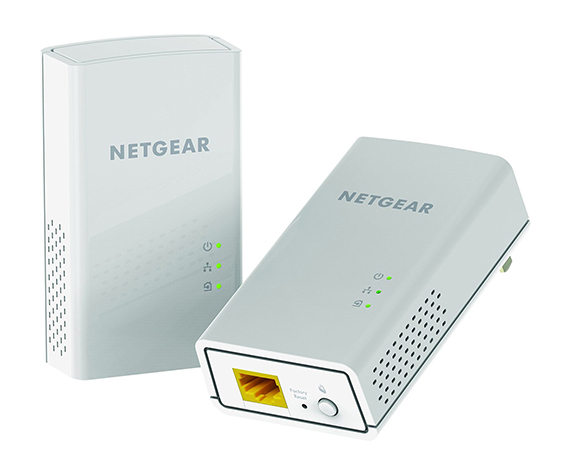 The Netgear PL1200 features a compact design, with a white plastic body, covered by a glossy finish. It’s not really stylish and it doesn’t really need to be as it will most likely end up covered by a piece of furniture or simply in a place where it won’t attract any attention. The adapter uses a cheater plug (three-prong), it’s HomePlug AV2 compliant and a single unit measures 4.72×2.28×1.65 inches and weighs 0.40 lbs. Considering its size, the Netgear PL1200 is slightly bigger than other similarly priced adapter and could obstruct a top electricity socket. 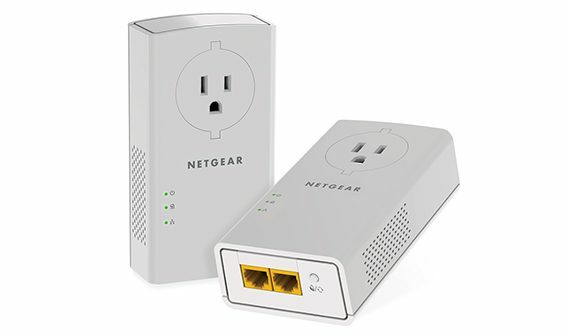 Fortunately, you could get the Netgear Powerline PL1200-100PAS, which has an extra outlet built inside the case and provides a pass-through socket on each unit, so you don’t lose an electrical outlet in each room where you have connected a powerline adapter (but, for an additional cost). The PLP1200-100PAS is also significantly taller than the base PL1200 model. The front of the adapter is home to the LED lights for Power, Ethernet and Powerline, which has a Pick and Plug feature. This feature helps you pick the best outlet where you will get the strongest signal, by displaying a specific LED colour. If the LED light is green you get the best performance (more than 80 Mbps), otherwise, if you get the amber light, the link rate is between 50 and 80 Mbps. Lastly, the red light means a link rate lower than 50 Mbps. On the bottom of the device, rests a single Gigabit Ethernet port, a Factory Reset recessed button and a Security button. Note: It is quite unfortunate that both the Netgear PL1200 and PLP1200-100PAS only feature a single Ethernet port, especially if you have more than one device close to each other (although you can purchase a extra multi-port Ethernet Switch). As expected, the Netgear Powerline PL1200 is very easy to setup. 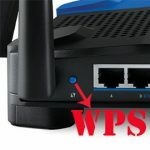 The first thing you have to do is connect one unit to the router or switch by inserting an Ethernet cable into a LAN port on the router and the other to the Ethernet port on the adapter. Afterwards, plug a second PL1200 unit into a socket next to the Ethernet-ready device you want to connect to and just like before, connect them using an Ethernet cable. Wait until the Power and Ethernet LEDs turn green and use the security button to secure your network (very important!). And you’re done, it’s that simple. 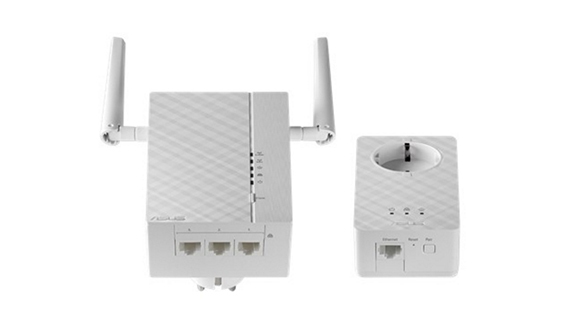 Note: Some adapters offer wireless access point capabilities, so you can connect wireless clients to the Powerline adapters. Netgear PL1200 or PLP1200-100PAS do not have this feature implemented. 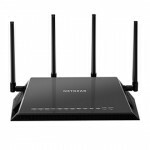 In terms of performance, the Netgear Powerline 1200 won’t deliver the promised 1200 Mbps speed, which is measured in full-duplex (meaning both the transmit and receive speeds are counted together). Keeping this in mind, the adapter did really good. In good to ideal conditions, meaning no microwaves, using the same circuit and at a close distance (about 10 feet), the adapter delivered up to 246 Mbps. But, in the real world (in a different room at around 30 feet and with some interferences) it didn’t get below 120 Mbps. But these speeds may vary and you may get a different result, depending on your wiring setup. 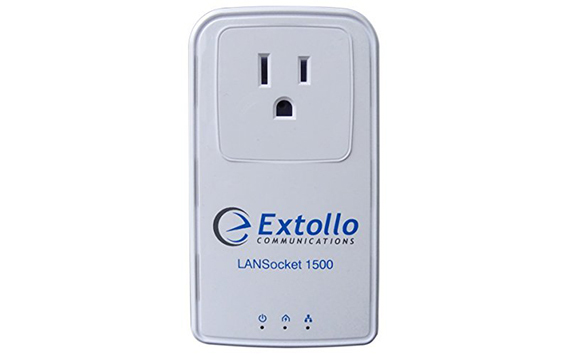 The Extollo LANSocket 1500 was released at the middle of 2015 and is one of the fastest powerline adapters on the market. The kit includes two identical LANSocket 1500, two five-feet Ethernet cables and a Quick Install Guide. You are allowed to connect 16 simultaneous units on the same powerline network. The Extollo LANSocket 1500 features the common white case, with a blue logo and blue status icons on front. It lacks the glossy finish we found on other similar adapters, but, since it’s not a piece of technology you put in plain view (you tuck it in a hidden corner), it doesn’t really matter how attractive it really is. 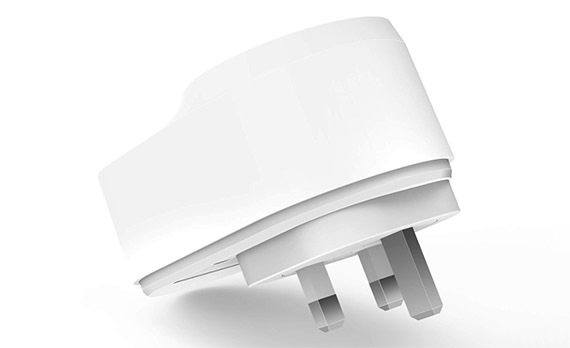 Extollo uses a three-prong plug, it’s HomePlug AV2 MIMO compliant and a single unit measures 2.5×1.5×4.5 inches and weighs 0.5 lb. 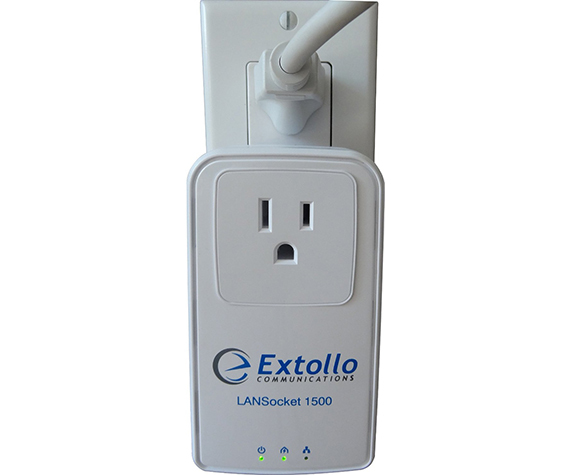 Depending on the type of wall sockets your house may have, it is possible that the powerline adapter may obstruct an additional outlet, but you don’t have to worry, because Extollo LANSocket 1500 has a built-in pass-through outlet (which has integrated filters for suppressing noise from attached electronic devices), so you won’t have to sacrifice a wall socket in the room where your adapter is installed. Although it features a built-in socket, the adapter is quite compact, considering that similar Netgear adapters have double the size of Extollo 1500. On the front of the adapter, underneath the pass-through outlet, there are three LED lights for Power, Ethernet and Powerline. As expected, the Powerline LED features three different colours which show you the best place to install the adapter. The green LED lights means the signal is excellent and you get speeds greater than 100 Mbps; the orange light means the signal is good and you’ll get speeds between 51 and 99 Mbps; the red LED light means you have a weak signal and you’ll get speeds lower than 50 Mbps and should consider a different outlet. On the right side of the adapter you can find the Sync button (to reset to factory settings, hold the button for more than 15 seconds) and on the bottom, a single Ethernet port. Unfortunately, there is no variant that features more than one port, so you’ll need a different adapter for every Ethernet-ready device or to purchase a multi-port switch. Since powerline adapters have simplicity as one of the main selling points, it’s expected that the setup process to be simple, and similarly to other powerline adapters, the Extollo LANSocket 1500 will not take you more than 5 minutes to setup. 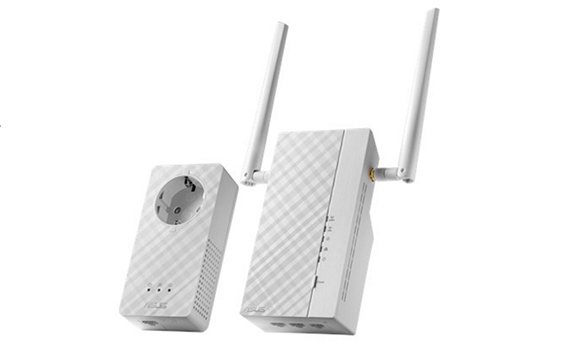 The process is simple, you get one powerline unit, connect it via an Ethernet cable to a router or switch (don’t forget to use a LAN port), afterwards take the second Extollo adapter, connect it to an Ethernet-ready device and plug the adapters into a wall socket. Now, you only have to secure the network (you don’t want your neighbours to have access to it). This is also a simple process, you have to press and hold the Sync button for 10 seconds to change the default NMK (Network Membership Key) to a new one. You will know the NMK has changed after the blinking LED will turn solid. repeat the same steps for the second unit. Lastly, while both adapters are connected to a wall socket press the Sync button on the first unit for 3 seconds and afterwards press the same button on the second unit (you will have 2 minutes to do so). And you’re done. Extollo LANSocket 1500 features both Beamforming and the 2×2 MIMO technology. The Beamforming tech creates two independent signal paths in order to optimally focus the transmission to and from client adapters (avoids low performing paths and takes advantage of channels with strong performance). We tested the Extollo LANSocket 1500 in two different conditions, the first was a close-to-ideal scenario that can be accomplished if you know the wiring of your home, don’t put the second unit too far off and keep the interference to a minimum and a second scenario, where we disregarded everything we did in the first scenario. So, in ideal conditions, with the units at around 10 feet apart (on the same circuit) we got a maximum of 375 Mbps. In less than ideal conditions (at more than 30 feet apart, with some interferences), we didn’t go below 200 Mbps. This are really good speeds and the performance is really great, making the Extollo LANSocket 1500 one of the best performing powerline adapters on the market. 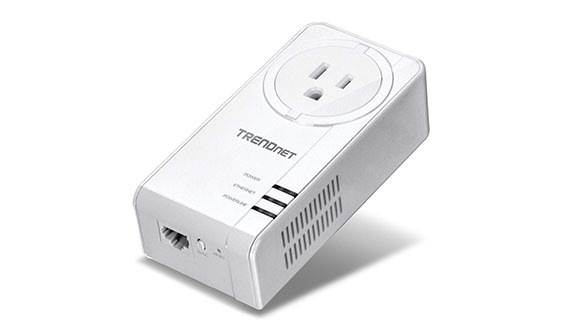 The TRENDnet TPL-423E is the newest powerline adapter from the Californian-based company and the latest attempt to improve its existing line of powerline products, while further perfecting the way the user can receive a decent Internet connection via the existing electricity cables. Besides taking advantage of the Powerline 1300 technology, the highlighted features of the TPL-423E are the BeamForming and the MIMO (Multiple Input Multiple Output) technologies. The kit (TPL-423E2K – with two identical adapters) includes a Quick Installation Guide, a CD-ROM (Utility and User Guide), two 5-feet Ethernet cables and two identical powerline adapters. It is recommended to connect a maximum of 8 adapters to a single network. The TRENDnet TPL-423E is identical to its predecessor, the TPL-421E2K (an AV2 1200 powerline adapter), so it sports the same small rectangular case with soft rounded corners and it is covered by a white matte finish to repel fingerprints (not that you’re going to touch the device a lot). Furthermore, on the front side, the TPL-423E is also equipped with a three-prong plug (the device is compliant with the HomePlug AV2 standard) and, overall, the adapter remains quite compact and it keep both the weight and the dimensions of its predecessor: it measures 4.73 x 2.4 x 2.6 inches and weighing 6.2 oz. Despite being rather small and lightweight, it still may obstruct an additional socket, so the additional pass-through outlet is a suitable addition. 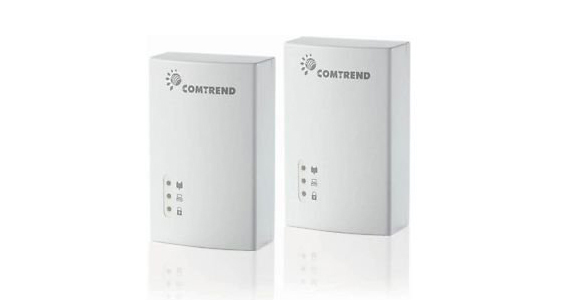 Immediately underneath the pass-through outlet (and under the TRENDnet logo), you can find three LED indicators positioned horizontally, responsible for Power (blinking indicates that the sync is in progress), Ethernet (blinking indicates that data is being received / transmitted) and Powerline. The Powerline LED will display a certain colour, depending on the link rate strength to help you choose the best spot where to install the adapter. So, if the LED displays a solid green colour, you get the best performance, otherwise, if it’s solid amber, the link rate is good and if it’s red, the powerline is simply connected so, to get a decent link rate, you should find a better spot (if the indicator is flashing, then data is being transmitted / received over powerline). The bottom of the adapter is home to a Sync button, one Gigabit Network port and a recessed Reset button (to return to factory settings insert a paper clip and hold it for 1 second – it will reset to the default private network name ‘HomePlug AV’). I noticed that on the sides, the TPL-423E features some ventilation holes in hopes that it will help with maintaining a good internal temperature (the device still remains a bit warm while functioning, but that’s something that stands true for almost all powerline adapters). Setting up the TRENDnet TPL-423E2K is easy and straight-forward. 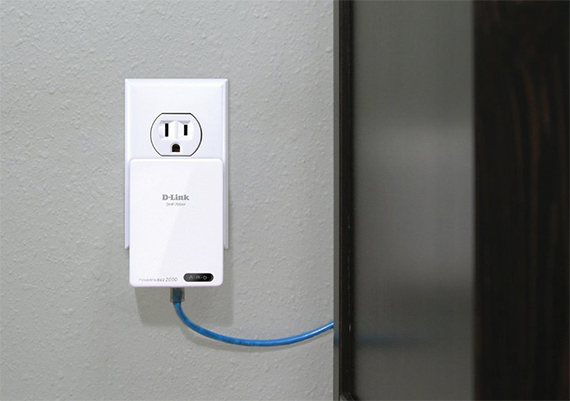 First, pick one unit and connect it to a router (or switch) using the provided Ethernet cable and afterwards, plug it into a wall socket. Next, repeat the same steps and connect a second adapter to the device of your choice. Finally, you may want to secure your network. To do this, press and hold the Sync button for 2 seconds. Afterwards, you will have 2 minutes to press the Sync button on the second adapter. And that’s it. 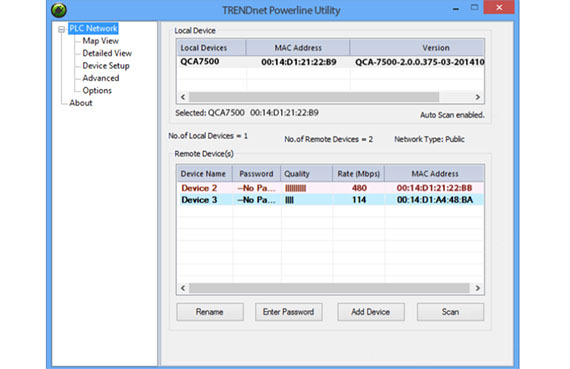 The TRENDnet TPL-423E2K can also be configured using the Powerline Utility app that you can install on your PC using the provided CD. After you install the utility, by following the steps provided by the Wizard, you get access to the app interface. Here, you can have a look at the PLC Network, with its specific sections: Map View (view the connected devices, add passwords and add new devices), Detailed View (info about the PC, adapters and the utility version), Device Setup (set Local Device, Private Network Name, Multicast Address and more), Advanced (Upgrade Firmware, QoS settings and Reset Device) and Options (Auto Scan interval) and finally, the About section. Testing the TPL-423E in close-to-ideal conditions (I put 10 feet between adapters, kept the interferences to the minimum and used the same circuit) will deliver no more than 190 Mbps. In less-than-ideal conditions (more than 30 feet distance between adapters, some interferences) will deliver an average of 70 Mbps. The Comtrend G.hn PG-9172 adapter is not really the same as the other powerline units we have tested so far and that’s because it isn’t based on the HomePlug Powerline Communication standard, but on a new technology called G.hn. The G.hn standard supports data transferring through electrical wires and also, through coaxial and telephone wires. The HomePlug adapters can only be used with electricity cables. The kit includes the usual two identical powerline adapters, two Ethernet cables and a Quick Install Guide. Similarly to the HomePlug adapters, you can add a maximum of 16 adapters on a single G.hn network. In terms of aspect there isn’t any major difference between the Comtrend G.hn PG-9172 and other adapters, you get the same rectangular white case, but without the glossy finish. It’s not going to win any design awards, but since it’s unlikely that you will put the adapter anywhere in the centre of attention, it doesn’t really matter. Comtrend uses a three-prong plug, it measures 3.6×2.3×1.2 inches and weighs 0.55 lb. It’s not a particularly large device, but it’s not small either and, depending on the design of your power sockets, it may block adjacent outlets. Unfortunately, this model does not have any variant with a pass-through outlet, so you may have to sacrifice an outlet in the room where the adapter will be installed. On the front of the adapter you will find three LED indicators for Coverage, Ethernet and Security. The Coverage LED can help you place the adapter in the perfect spot for the best speeds. So, if the LED is Green, you get a line rate greater than 40 Mbps, else, if the LED is orange you get speeds between 20 and 40 Mbps and if the LED is red, the speeds will be below 20 Mbps and you may need to find another outlet for a better performance. On the bottom of the adapter rest the Config button (press it more than 10 seconds to return to factory settings) and a recessed Power Saving button (you have to press the button for two seconds using a paper clip to enter in power saving mode). If you have more than one devices that need to be connected to the adapter, you will have to rely on a multi-port Ethernet switch, because there is no other adapter variant that has more than one Ethernet ports. Setting up the Comtrend PG-9172 is no different than with any other powerline adapter. You have to connect the first unit to a router or a switch via an Ethernet cable (use the LAN port) and then plug in the adapter to a wall socket. Repeat the same process and connect the second adapter to an Ethernet-ready device. Next, press the Config button and when the Security LED starts flashing a green light, press the Config button on the second adapter. After both adapters have a solid green LED, it means the network is secure and ready to use. You can access the adapter interface using a browser. To do this you have to enter the device’s IP address in the browser (for example https://192.168.0.3) and when prompted, enter admin for Authentication password and betera for Factory Reset (if you want to return the adapter to factory settings). The interface allows you to configure the IP (IPV4, IPV6 and mixed), the Ethernet (Power saving), Device (software and hardware information, as well as Security setup and firmware update), Multicast configuration, QoS configuration, VLAN, G.hn spectrum, Log file and Advanced (Broadcast suppression, Hardware Reset and Factory Reset). We tested the adapter in good to ideal conditions, without interferences, in the same circuit and at no more than 10 feet apart and we got up to 270 Mbps. When at about 30 feet apart and with some interferences (mimicking real life scenarios) the speed didn’t go below 120 Mbps. 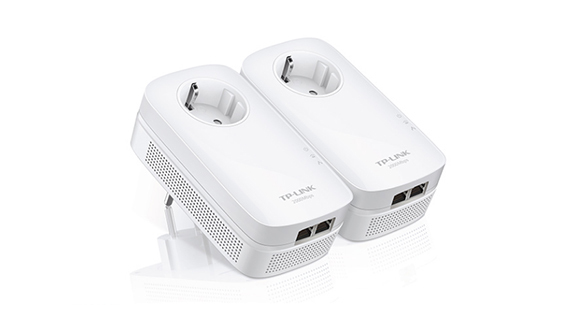 TP-Link TL-PA9020P is the latest powerline adapter from TP-Link and the first from this manufacturer to claim the AV2000 speed performance (surely, this are theoretical maximum speeds and the real throughput will be no more than a quarter). The kit includes two AV2000 TL-PA9020P adapters, two 6.5-feet long RJ-45 Ethernet cables and a Quick Installation Guide. While the TP-Link TL-PA8030P AV1200 allowed up to 254 nodes on a single powerline network, I was surprised to see that the newer TL-PA9020P took a backwards step and only allowed a maximum of 8 nodes in one powerline network. There are no major differences between the TL-PA9020P and its AV1200 predecessor. You get the same non-intrusive rectangular box with soft rounded corners, covered by a white glossy finish and with small patches of vent holes all around the edges of the adapter. 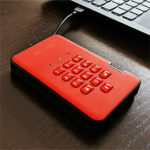 The device remains a bit large (measuring 5.2 x 2.8 x 1.7 inches), but if it covers your double-wall socket, it has a built-in pass-through outlet that allows you to connect additional devices (useful if the room doesn’t have lots of power sockets). Also, be aware that the pass-through outlet has a two-prong plug instead of three prongs, because the adapter covers the third hole. Besides the pass-through socket, on the front of the TL-PA9020P there is a vertical array of three LED lights, responsible for Power (if it blinks once every second, it means that the device is in the process of pairing; if it blinks once every 3 seconds, then the Power Saving mode is on), Powerline (red means that the network is in poor conditions, so you could try another socket; yellow-green means that the network is stable and in good conditions) and Ethernet. On the right side of the powerline adapter, there is a small Pair button (press and hold it for a second to join a secure powerline network or to set up the device; hold the button for about 8 seconds to leave an existing powerline network; hold the button for more than 15 seconds to reset the adapter) and on the bottom of the TL-PA9020P, there are two 10/100/1000 Mbps Ethernet ports. If two ports are not enough, you can always add Ethernet Switches and further expand your LAN network. Note: You can check out our round-up of the best Ethernet Switches. Setting up the TL-PA9020P involves plugging in the adapter into a wall-socket (directly into a wall and not using a multiple sockets device) and add an Ethernet cable to connect the adapter to your PC’s LAN port. Afterwards, it is very important to secure your powerline network. The HomePlug AV standard uses the 128-bit AES encryption which allows a safe communication between your devices. The Pair button allows you to create a secured powerline connection between HomePlug AV devices, all you have to do is press the Pair button of the first adapter (the Power LED will flash) and within 2 minutes, press the pair button on the second powerline adapter (the Power LED of the second adapter will start flashing). Now, wait for a minute for the two powerline adapters to connect and when the Power LEDs will stop flashing and display a solid light, the pairing has been made. Furthermore, TP-Link provides a small management utility that gives you an overview over the status of your powerline network and allows you to upgrade the firmware (there are also some basic QoS settings). Testing these adapters in ideal conditions (same circuit, no interferences, no more than 10 feet between them), we measured a maximum throughput of 296 Mbps. After some additional devices were added to the circuit and some more space was put between the adapters (around 30 feet), we measured a maximum of 122 Mbps. 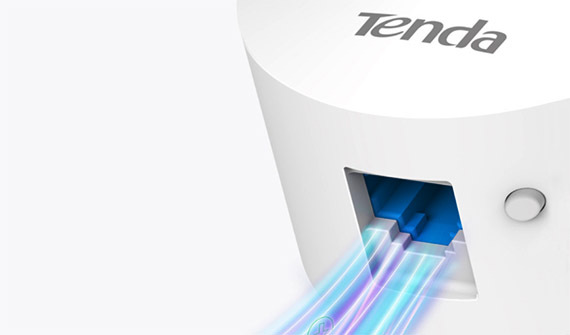 Just like almost every other manufacturer of networking devices, Tenda offers a large variety of options to easily and reliably cover your home with WiFi, ranging from the regular router and access point to the newer WiFi mesh system and, if these solutions won’t work for your house, you can use the Tenda powerline adapters. The manufacturer has entered this market about three years ago, but I’m going to focus on the latest addition to the series, the Tenda AV1000 PH6. You may have noticed that the PH3 is also AV1000, so what does the PH6 bring new to the table? Well, they’re pretty much the same product from the performance point of view, but while the PH3 focuses towards being as unobtrusive as possible, the Tenda PH6 is larger, but it comes with a pass-through socket. 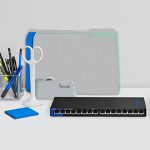 Furthermore, the kit includes two identical AV1000 Tenda Powerline AV2 1000 Gigabit adapters, two Cat5e Ethernet Cables and one Quick Installation Guide. The Tenda PH13 is a small and very compact device, measuring 3.22 x 2.36 x 1.25 inches, so, in most cases, it shouldn’t cover any additional power sockets. 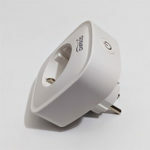 Even so, the powerline adapter would still seize one socket, so, to still allow additional devices to connect, Tenda solved this problem by adding a pass-through outlet (therefore, creating the PH6) and, as a consequence, the new powerline adapter is larger and heavier (it measures 4.27 x 2.42 x 1.77 inches). But the size is not the only element that has changed, Tenda decided to completely redesign the case, so, instead of the rectangular white box, we now get an oval plastic body, covered by a white finish. On the front side, the case slightly protrudes to accommodate the circular pass-through socket (on the other side featuring a HomePlug AV2 compliant three-prong plug – if you’re in the US) and, a bit towards the bottom, there’s the LEDs area. The first LED indicator shows the status of the Power (solid green means that everything is working properly and the device is connected to a power source, while flashing green indicates that the powerline adapter is in Power Saving Mode), the second LED shows the status of the Powerline connection (the LED will blink green when the device is pairing with other powerline adapters and it will be solid green after the process is concluded; the LED will be solid red when the network connection is poor, so it is advisable to connect the PH6 to another power socket) and lastly, there’s the Ethernet port (solid green indicates that the Ethernet cable has been connected properly). On the bottom of the adapter, you’ll find a single Gigabit RJ45 LAN port (if this is the primary PH6, then use it to connect to the router, otherwise, if it’s a secondary powerline adapter, then the Ethernet port can be used to connect additional wired clients or access points) and, next to it, rests a Pair/Reset button which, when pressed, it will initiate the pairing process; if pressed and held for more than 6 seconds, it will return the device to factory default settings. 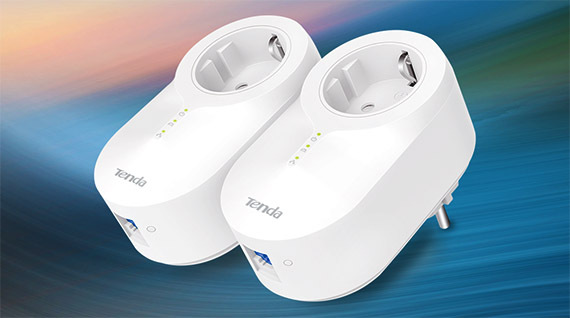 To properly set up the Tenda PH6 AV1000 you have to follow the same routine as with the other powerline adapters: first, connect one unit to a switch or router using the Ethernet cable provided and then plug into a wall socket. Afterwards, connect the second unit to an Ethernet-ready device and plug it into a nearby outlet (it’s advisable to avoid connecting the adapter to a power strip). 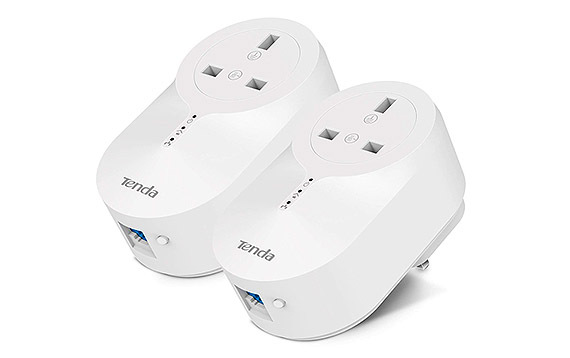 The Tenda powerline adapters will pair automatically after they detect each other on the same circuit, but you can use the Pair button if you want to either create a secure network or if you want more than one powerline network on the same circuit. The process is quite simple and all you have to do is to press the Pair/Reset button until the Power LED will start blinking. This means that the adapter created a new, randomly generated encryption key. To finish the setup you will have one minute to press the Pair/Reset button on the second unit. Tenda advertises the PH6 as being capable of delivering a throughput of up to 1 Gbps, but, in reality, this is just a theoretical maximum allowed by the chip (also consider the full-duplex aspect). In close to ideal conditions (adapters are 10 feet apart, less to no interference and the same circuit) you will get a maximum of 148 Mbps. Emulating not-so-ideal conditions (30 feet apart, some interference), the adapter scored up to 43 Mbps. 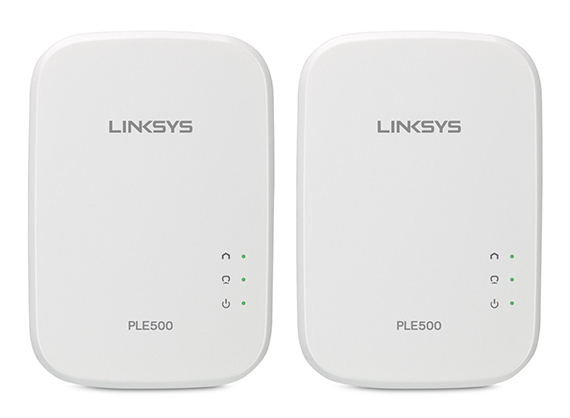 Linksys PLEK500 was released in 2013 and it was the first adapter kit that supported the latest HomePlug AV2 standard. The kit includes two identical PLE500 single-port Powerline adapters, two five-foot Ethernet cables and a Quick Start Guide. 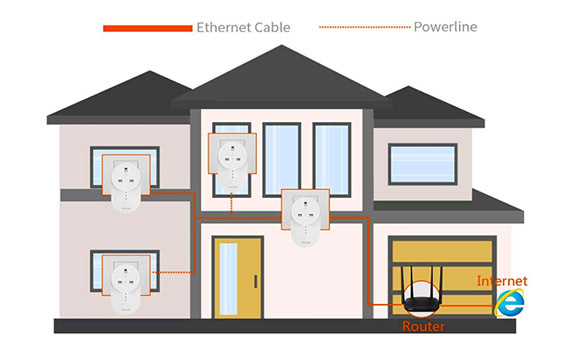 You will be able to connect up to 16 adapters on a single powerline network. 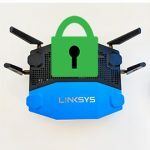 Similarly to the D-Link DHP-601AV, although the Linksys PLEK500 was released almost three years ago, its appearance won’t give away it’s age, looking similar to the newer and more advanced adapters. That being said, the PLEK500 has a white case with rounded corners and a glossy finish. 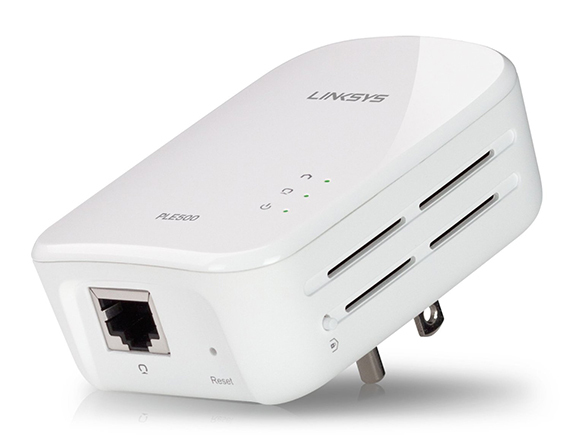 Linksys PLEK500 uses a three-prong plug and is HomePlug AV2 compliant. 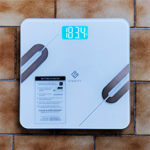 One unit measures 4.0×2.0x2.83 inches and weighs 0.26 lb. This means that although quite lightweight, it may cover an additional outlet. Since there is no variant of the adapter that features a pass-through outlet, you may be constrained to sacrifice the wall socket in your room where your adapter will be connected. The front of the adapter is home to three LED lights positioned vertically, responsible for Powerline, Ethernet and Power. The Powerline LED will help you choose the best place to connect your adapter so you get the best performance. If the Powerline LED is flashing fast a green light, it means you will get speeds more than 15 Mbps. Otherwise, if it flashes a yellow light, the link rate is lower than 15 Mbps and it may be advisable to choose another outlet or circuit. On the bottom of the adapter rests the Ethernet port and a recessed Reset button (using a paper clip, you can return the adapter to factory settings if you press and hold for 10 seconds). Also, on the right side, you can find the HomePlug Simple Connect button for security (uses a using a 128-bit AES encryption). In order to setup the Linksys PLEK500 you have to follow some simple steps. First of all connect an adapter to a router (or switch) using an Ethernet cable and then plug it into a wall socket. Next, connect another adapter to the preferred device and plug it into a nearby electrical outlet. Afterwards, if you want a secure network you will have to press and hold the HomePlug Simple Connect button for a second to generate a new unique encryption and then you will have two minutes to press the same button on the second unit. And that’s it, your new network is ready to be used. 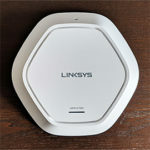 Linksys PLEK500 also has an Advanced Configuration application that can be downloaded from Linksys.com/support. The interface has three sections for Network Status, Security (configure the network key for each device) and Administrator (restart the adapter, restore to factory settings or upgrade the firmware). The Linksys PLEK500 has a theoretical cap at 500 Mbps, which is way below what the AV2 adapters are capable of (see the above adapters), but for downloading large files, streaming video and Internet browsing, it should be fine. In close to ideal conditions, meaning less interferences and a small distance between adapters, we recorded a maximum of 107 Mbps and in real life conditions, meaning a bigger distance between adapters and some interferences, the PLEK500 will deliver an average of 45 Mbps. Asus is one of the most popular manufacturers of electronic devices, its products including consumer-grade wireless routers, modems, laptops, computer hardware and more. 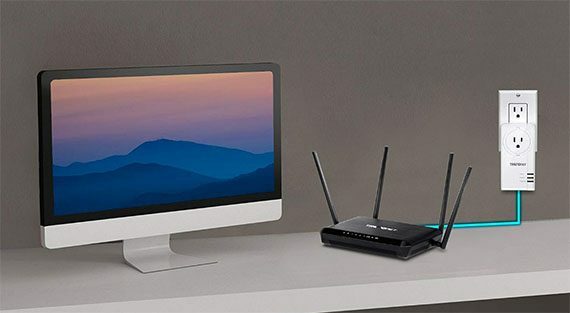 Because of the high-speed AC1900+ routers, Asus also became well known in the networking world and that gave the company enough courage to enter the powerline field. That’s how the Asus PL-AC56 came into existence. 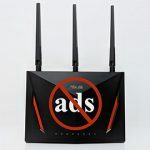 The PL-AC56 Kit includes a PL-AC56 Wireless AC1200 WiFi PowerLine extender, a PL-E56P HomePlug AV 1200Mbps PowerLine adapter, two Ethernet cables, the external antennas for the PL-AC56 and a Quick Start Guide. Note: You can add up to 8 PL-AC56 powerline adapters on a single network. The PL-AC56 kit is a bit different than the other powerline kits on the market. Sure, the PL-E56P features the same rectangular white box, rounded corners, with the distinctive factor being the diamond pattern on the front of the device (similar with the finish from the top of the Asus RT-AC68U). But, the interesting addition is the PL-AC56 extender, which is a lot larger than many powerline adapters (it measures 5.9 x 3.1 x 1.7 inches and weighs 1.7 pounds), so it will, without a doubt cover any adjacent wall socket. Thankfully, at least the PL-E56P has a pass-through outlet, so using the adapter will allow you to still connect another device to the same wall socket. The PL-E56P powerline adapter (the smaller one) has three LED lights on the front for showing the status of the Powerline connection (if the LED blinks every 15 seconds, it means that the device is in Power-Saving mode), the Ethernet and the Power (if the LED is blinking every second, it means that the pairing process is in progress). On the bottom of the device, there is an Ethernet port, a recessed Reset button (you need to keep the button pressed for about 5 seconds to return the device to the factory default settings) and a Pair button (press and hold the button for a second to start the pairing process). The PL-AC56 extender has four LED lights on the front for the 2.4GHz and the 5GHz WiFi network (if any of these two LEDs is blinking rapidly, it means that the extender is cloning the parent’s access point SSID and password, otherwise, if it blinks every second, then it is returning to factory default settings), the Powerline connection, the Ethernet and Power. Under the LED lights there’s a Clone button, useful for cloning the SSID and password from the parent AP. On the left side of the device, there are three buttons for Resetting to the factory default settings, switch the extender ON or Off and activate the Pairing process. On the bottom, there are three 10/100/1000M Ethernet ports to connect your wired clients (useful because it nullifies the need of a network switch). Since we’re dealing with Plug-n-Play devices, it’s quite easy to setup the PL-AC56: plug the PL-E56P adapter into a wall socket, next to a router and use an Ethernet cable to connect to one of the router’s LAN port. Next, choose the place where you’ll plug the PL-AC56 extender (ideally, in the same circuit as the adapter) and, in order to secure the device, press the Pair button on the adapter and, afterwards, press the Pair button on the extender. Now, wait until the powerline LED lights up and that’s it, you now have a secured powerline network. Additionally, Asus provides its users the possibility to configure the wireless settings using a web utility. To access the interface, go to https://ap.asus.com and, when prompted to insert the user name and password, enter admin for both. The UI is simple and clean, having the same colour palette and structure as the other Asus routers interface. On the left, there’s the main menu, with three sections: Quick Internet Setup (check the connection, setup the Internet and the router), General (Network Map) and Advanced Settings (Wireless, LAN, Administration, System Log and Network Tools). Since the PL-AC56 kit includes an AC extender, I am going to test the wired and wireless performance. First, I used the 2.4GHz radio band and, having the extender and adapter close to each other (at no more than 10 feet), I measured a maximum of 56Mbps. Afterwards, I increased the distance to 30 feet and the speed decreased to 22Mbps. Next, I switched to the 5Ghz radio band and, while the devices were close to each other, I measured a maximum of 187Mbps (a very good result for a powerline network) and, when there were 30 feet between the devices (with some interference), the speed decreased to 94Mbps. Lastly, I measured the wired performance of the powerline network and, at 10 feet, I measured a maximum of 258Mbps and, at 30 feet, the speed went down to 123Mbps.